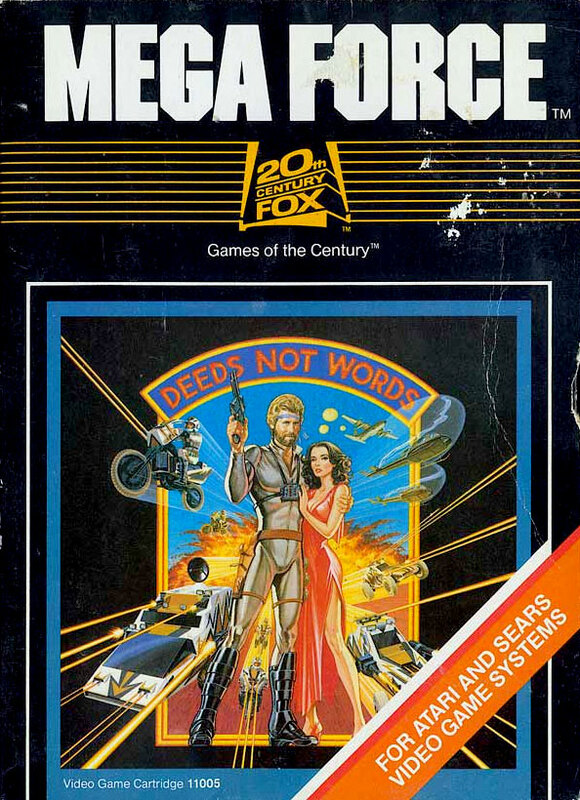 Mega Force is a single-player game based on an action film made in 1982. The movie was considered a failure on several fronts and the video game was never regarded with much more empathy. The game was dismissed as an average shooter with no outstanding qualities. 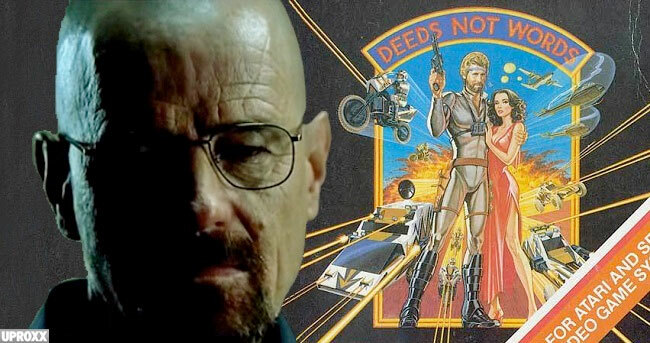 Despite being a terrible movie, a sequel was considered and the title was curiously the subtitle seen on the cover of the Atari 2600 game; Deeds Not Words. The sequel was never made. If there was anything deserving of a sequel, it's Mega Force the Atari video game. For all the complaints about the film - both theatrical and DVD releases - the Atari video game has some interesting facets. Most notably is the automatic conversion of your motorcycle from dirt bike to flying jet-bike simply by moving it across the horizon line. Slick! Your character is a clever & daring member of the MEGAFORCE and you have been sent to Sardoun. It is a city in a strategically important Democratic nation currently under attack. Your goal is to destroy the Enemy's Headquarters. You ride an advanced fighting machine, the Moto-Fighter which acts as a motorcycle on land, but takes to the air with ease and flys. You begin when you are dropped off just outside Sardoun. You must navigate past the city and across the desert to the Enemy Headquarters. You have a limited supply of fuel and you'll be challenged the entire way by heavy air and ground attack. Should you travel too far into the barren desert, flashing arrows will guide you back to the enemy. That's the only help you'll get. This single player side-scrolling game puts you on a motorcycle journey from left to right. You can turn around to fire on enemies, but you are crossing a desert to get to the enemy's Headquarters. A widget at the top of the screen tracks your lives, fuel and gives warning to various enemy activities. Megaforce is an action film made in 1982 directed by former stuntman Hal Needham and starred Barry Bostwick. The film was a critical and commercial failure in it's release and was nominated for three Razzie Awards, Worst Picture, Worst Director and Worst Supporting Actor- Michael Beck. Surprisingly, the Atari 2600 video game is pretty good. Before Bryan Cranston was in Breaking Bad, he was in numerous '80s commercials including this ad for MegaForce on the Atari 2600. Check it out on YouTube. 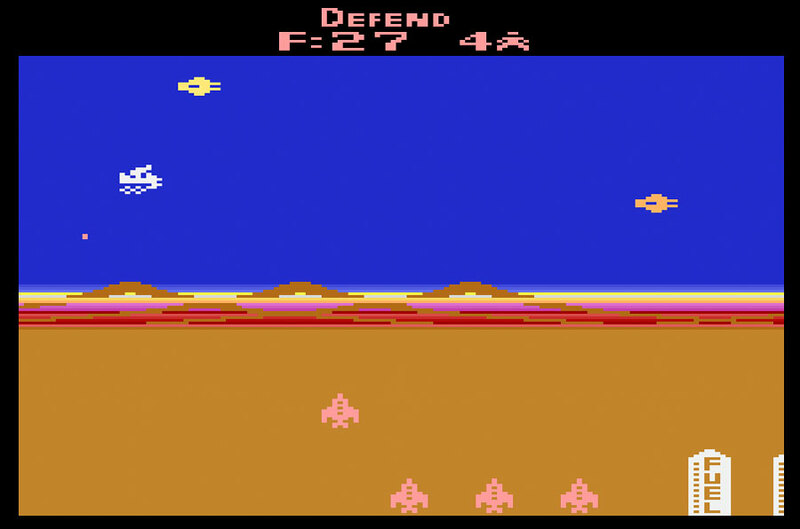 Each game is comprised of several increasingly difficult levels A level ends when the Enemy Headquarters has been destroyed. Remaining lives are carried over into each new level and all Objects, Prizes and Fuel are replenished. At the start you have the ability to start at more advanced levels via the Select Switch. LEVEL 1--NORMAL GAME PLAY: You begin the game with 39 gallons of Fuel and 4 Moto-Fighters. You can gain up to 59 gallons of Fuel during play. LEVEL 2--ADVANCED GAME PLAY: You begin with 29 gallons of Fuel and 3 Moto-Fighters. You can only gain up to 59 gallons of Fuel during play. LEVEL 3--EXPERT GAME PLAY: You begin with 19 gallons of Fuel and 4 Moto-Fighters. You can gain up to 59 gallons of Fuel during play. LEVEL 4--EASY PRACTICE GAME: You begin with 99 gallons of Fuel and 8 Moto-Fighters. Also, Enemy Aircraft do not shoot at you. As with many single player games on the 2600, the difficulty switches are programed for 4 different scenarios that can be combined with both switches. This is the case with Mega Force. LEFT DIFFICULTY SWITCH A: Prizes under Fuel Depot appear in random order. LEFT DIFFICULTY SWITCH B: Prizes appear in fixed order. RIGHT DIFFICULTY SWITCH A: Enemy Aircraft allowed to pass you will head for Sardoun and attack it. RIGHT DIFFICULTY SWITCH B: Enemy Aircraft allowed to pass you will stay and protect Fuel Depots. They will occasionally go to Sardoun. As your bike travels up and down you convert from dirt bike to flying jet-bike. This automatic feature is pretty slick and gives the game an interesting dynamic. On the ground your missiles act more like bombs and descend on the buildings. In the air you shoot straight taking out enemies that hover nearby. Overall, there is a lot of nice detail in both the mountainous horizon and the buildings below. Explosion sounds are combined depending on the scenario resulting in some nice sound effects. The pace is quick and the transformation from land to air is very seamless and doesn't cause any game lag. I have to say this is a great game compared with how vilified the film became. Part of it's dismissal as a generic shooter may come from it's origin. Titles like this one were often regarded higher if they were arcade ports. Coming from an awful movie may have had a more negative effect on Mega Force than it deserved. If the manic excitement of Mega Force taxes your ability to defend your city, you can rest by heading for the desert area left of Sardoun or to the right of the Enemy Headquarters. Enemy Aircraft can't fly into these areas and while you are resting there, they will not bomb Sardoun. Sweet! is a surprisingly fun game with some interesting dynamics. Perhaps is was tainted by the lousy movie on which it's based, but it's visually pleasing with good sound and game play. The changing bike is a nice touch. We like shooting at things and Mega Force does it well.